AdReel makes profiting from premium traffic a reality for marketers of ANY level. Traffic And Conversions. That’s The Game. Period. Get traffic, convert it into leads and sales, get paid. Simple concept - not always easy to do. You can make the highest possible profits from your own campaigns. Hey Ryan Phillips and Chris Bell here. We’ve found that video is the easiest and most effective way to maximize profits. Volume, engagement & motivated consumers. That’s what these platforms give you - and now you can tap into ALL 3 at the SAME time. Thanks to our strategy, converting this traffic into leads and customers has NEVER been easier. The secret to turning traffic into profits is simple. Just deliver your message in a way that people are PROVEN to respond to. We promised you’d never have to make a video from scratch … pay others to make them for you, or ever be on camera. So how are you going to tap into the conversion power of video ads? With our point and click system that creates top converting, animated video ads in 2 minutes flat… ZERO video creation or copywriting skills needed. Forget wasting your time on lousy traffic sources & messages that don’t convert.Time to get results FAST by tapping into what’s working right now. With our automated software, you’ll drive converting traffic for reliable profits in any niche. We use animated video ads because they drive traffic fast, then convert that traffic into leads and sales. And with our software they’re push button simple to create in 2 minutes flat. We’ve built this specifically to save you time and money. Then converts that traffic into profits with no previous skill or experience. "AdReel is super clean, super simple and super fast! I was spitting out quality videos within minutes of the very first time I logged in!" Took less than 3 minutes to create my first video. When I saw the quality of the video AdReel produced, I immediately realized I can use them in other areas too. 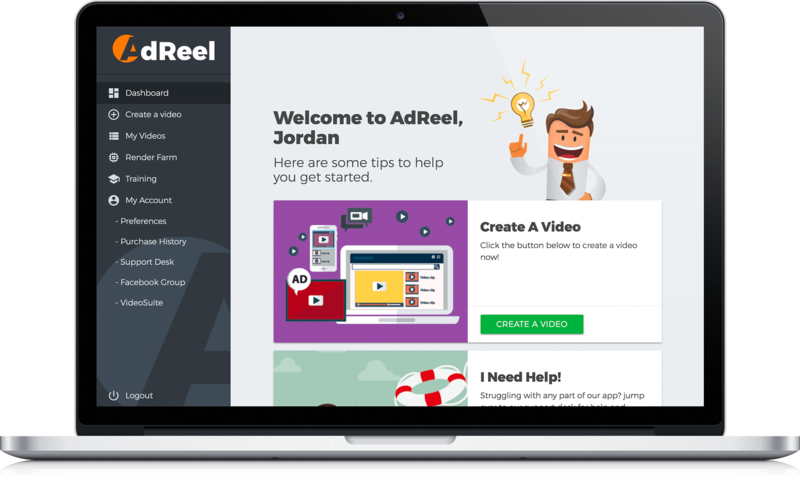 I am recommending AdReel to my clients and friends! PLUS you can use these as both blog and social media posts to drive completely free, organic traffic. All from 1 simple dashboard. No design or video skills. No need to even write your own ad copy. Ready-to-go ads perfect for FB, Instagram and YouTube, right out of the box. Get even BETTER results using these same DFY videos as social media and blog posts - Google LOVES video and these are YOUR shortcut to free organic traffic. Short & sweet messages are proven to out convert longer videos on social media. They’re also MUCH easier to repurpose for future campaigns than other video formats. So it takes you LESS time to make MORE money. AdReel lets you sell these premium services without any extra licensing requirements. It’s INCLUDED with your access today. This is a massively UNTAPPED market. Very few people provide animated video ad services - the ones that do are charging INSANE rates. Here’s your chance to make “first-mover” profits in a completely untapped niche, crush your competition and lock-in multiple, recurring contracts. Then make passive profits in minutes per month. Sounds Great But Will AdReel Work For Me? Absolutely And We Guarantee It! Pick up AdReel now, use it for the next 14 days, and ALL the risk is on us. See how easy it is to create top converting animated ads for your campaigns. Leverage the hottest sources of online traffic. Watch your conversions, leads and sales increase … or your money back. Reach out and we’ll refund every penny of your small investment, no questions asked. Now that we’ve made your investment 100% risk-free, it’s time to make a choice. Do You Want To Tap Into Top Converting Traffic For Personal Profit? Do It For The LOWEST Cost And HIGHEST ROI? In-Demand Services To An Untapped Market? Then hit the button below before time runs out. Thanks for visiting this page. It’s our sincere hope you reach all of your marketing goals. P.S. Traffic & conversions are all you need to profit. We’re handing them to you on a silver platter with the most advanced methods and point & click software ever created. Grab your access now to start making the profits you deserve. P.P.S. You have nothing to lose with our ironclad guarantee … and potentially life-changing profits to gain. You know what to do.